These are the first half of the Odyssey(ish)-patterned uniforms. 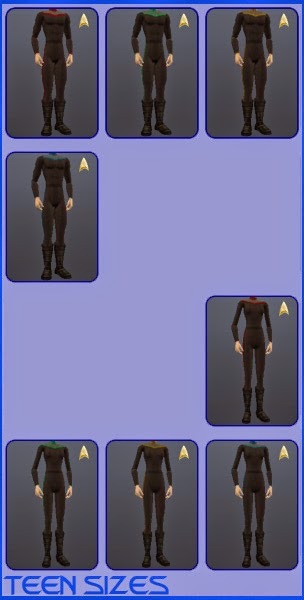 These are based on Mylochka's Academy uniform textures and mooglesims's space uniform PSD templates, but I had to do some serious retexturing to make them Sims 2 compatible. Even so, the larger sizes (such as BBG and HBB) don't jibe perfectly with the UV map and so the upper band is separated slightly where the chest joins the shouder. These uniforms use SynapticSim's Biker Boot clothing meshes, and so don't need the boot separates accessory. 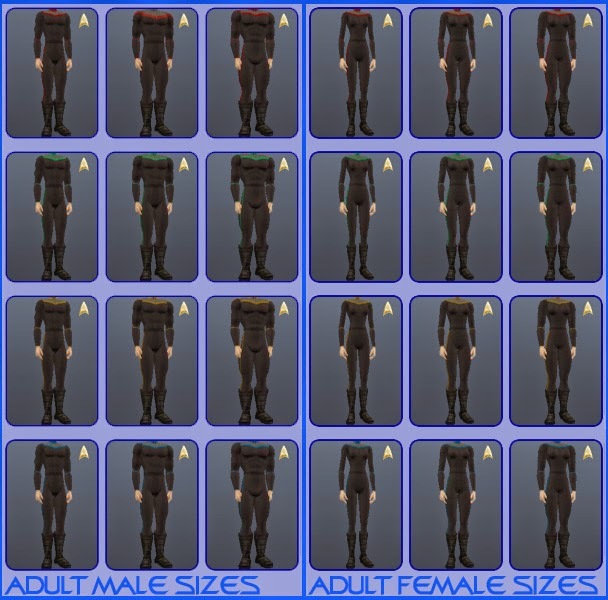 I don't use the MBB and AFDD meshes frequently, so I didn't make recolors for them. I've included the meshes down at the bottom in a separate link.